Greg Rebello knew exactly what to expect from Travis Wiuff and was more than ready for it in Friday’s main event at CES MMA 48. Facing a submission specialist with 97 fights under his belt, Rebello (24-8) stuffed an early takedown and pummeled Wiuff (75-22-1) with right hands to earn the stoppage 22 seconds into the opening round of their scheduled five-round title bout for the vacant CES MMA World Heavyweight Championship at Twin River Casino live on AXS TV. During the week leading up to the fight, Rebello predicted he’d the “same old Travis” on Friday against Wiuff, who entered with 25 submission victories on his resume. As expected, Wiuff shot for the takedown, but Rebello was prepared and finished the job within seconds to earn his first world title in his second attempt at the belt. 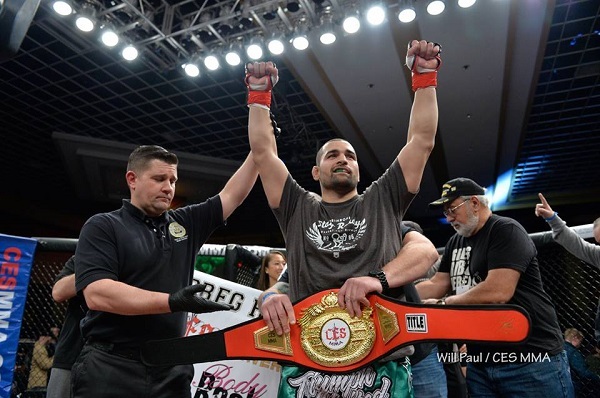 Rebello has now won back-to-back fights and takes home his first CES MMA championship after coming up short in his first attempt in August of 2016 against Ashley Gooch. Starring in the co-feature, East Providence, R.I., featherweight Dinis Paiva (11-6) absolutely dominated Arizona native Kevin Barberena (5-4), stalking down his opponent and peppering him over the course of three rounds to earn a 30-26, 30-26, 30-27 unanimous decision. Barberena, who entered Friday on a three-fight win streak, had no answer for Paiva’s speed or footwork as he backpedaled the entire fight to avoid Paiva’s signature overhand left. Paiva nearly ended the fight in the second round when Barberena turned his back to complain of an alleged eye poke, prompting Paiva to turn up the pressure and unload with a series of rights before Barberena could regain his composure. The third round was more of the same as Paiva continued to stalk him down while Barberena circled the cage without offering much resistance in return. Confident as ever, Paiva eventually dropped his guard and taunted Barberena as he continued to pepper him with jabs until the final bell. Paiva has now won four in a row and hasn’t lost a fight since 2015. Fighting for the first time in seven years following two deployments to Afghanistan as a U.S. Army Sergeant, North Attleboro, Mass., lightweight Brian Marino (6-1) earned a 30-27, 30-27, 29-28 unanimous decision win over Bronx native Jerome Mickle (3-4). Marino came out the aggressor in the opening, landing overhand rights that sent Mickle spinning toward the cage twice, but Mickle absorbed Marino’s best and kept pressing forward in the second and third rounds. 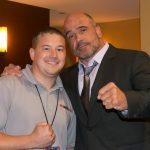 Marino held his own on the ground and maintained the upper hand in the striking department to end his long layoff with his fourth consecutive win dating back to 2010. Peabody, Mass., bantamweight Rico DiSciullo (9-1, 4 KOs) extended his win streak to three consecutive fights with a decisive, bloody win over Colorado Springs vet Jaime Hernandez (3-2) in the opening bout of the AXS TV Fights telecast. A knee to the forehead opened a nasty gash over Hernandez’s left eye midway through the opening round. Referee John English briefly halted the bout to allow the ringside physicians to examine the cut. The agreed to let the fight continue, but as DiSciullo began to unload on Hernandez, the cut worsened and the blood continued to flow to the point where Hernandez could no longer open his eye, forcing English to call at 3:21. Also on the main card, New Hampshire’s Tim Caron (7-1, 5 KOs) made his CES MMA debut in grand fashion, knockout out Mississippi’s Timothy Woods (7-6) with a hard slam to the canvas at the 1:23 mark of the opening round. Caron had Woods pressed against the cage early in the round and swept the left leg for a quick, single-leg takedown. Woods landed awkwardly on the top of his head and remained motionless for several minutes after the bout before being taken out of the cage on a stretcher. Returning to Rhode Island for the first time in two and a half years, Syracuse vet Shane Manley (4-3) outworked previously-undefeated featherweight Dylan Lockard (3-1) of Danville, N.H., to earn a 29-28, 29-28, 30-27 unanimous decision win. Outside of a short left that clipped Manley’s chin and sent him crashing to the canvas, Dylan had problems letting his hands go, overwhelmed by Manley’s superior size and strength on the ground. Manley let a couple of submission attempts slip through his grasp midway through the fight, but did enough in the clinch to earn the win, his second in as many appearances with CES MMA. A female flyweight war between Minneapolis’ Linsey Williams and Hilarie Rose of Norfolk, Mass., highlighted Friday’s preliminary card. Williams (2-2) dominated from the opening bell, scoring takedowns in each round and controlled the pace with effective ground and pound. Williams eventually wore down Rose’s defense and landed a series of unanswered strikes in the closing minute of the final round, prompting referee Kevin MacDonald to halt the action at the 4:01 mark. Rose (0-1) simply struggled to defend the takedown and couldn’t land effectively to stop Williams in her tracks as she barged her way in for the takedown each time. When Rose tried to walk the cage to get off the canvas, Williams simply overwhelmed her and pressed her shoulders to the mat. MacDonald briefly stood them up when the action slowed to a crawl in the second round. Williams argued for a second, then caught Rose with a shin to the chest to score yet another takedown, easily winning the round. The win was Williams’ first since May of 2017. Featherweights Brandon Marotte (1-0, 1 KO) of Hampstead, N.H., and Jhon Costa (0-1) of Somerville, Mass., debuted against one another in an entertaining scrap with Marotte earning the win 1:26 into the second round via technical knockout. The two traded takedowns and exchanges in a wild, back-and-forth opening round and Costa opened the second with a quick takedown, but Marotte eventually gained the upper hand and unloaded on Costa with unanswered strikes until English stopped the bout. Light heavyweight Fabio Cherant (1-0) of Wrentham, Mass., nearly made history in his professional debut, submitting James Dysard (0-4) via guillotine in just 15 seconds in Friday’s opening preliminary bout. Cherant came within 8 seconds of matching the fastest finish in CES MMA history, which belongs to Mike Rodriguez, who knocked out Hector Sanchez in 7 seconds at “CES MMA 41.” Sanchez coincidentally owns the second-fastest finish in promotional history with an 8-second knockout win over Dave Maggiore in 2012. Moments later, Ithaca, N.Y., middleweight Armus Guyton (1-0, 1 KO) nearly matched Cherant, knocking Tommie Davis (0-1) of Marblehead, Mass., cold with a wicked two-punch combination 29 seconds into the opening round of their scheduled three-round bout. Guyton nearly caught Davis with a head kick earlier in the round, but eventually found an opening and clipped Davis with a left hook followed by a right to the chin, sending his opponent crashing to the canvas unconscious.